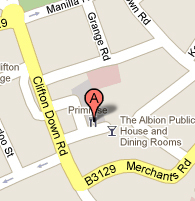 We are located in a vibrant part of Clifton village in Bristol. Opposite Clifton Arcade where we spent almost 10 years, a perfect place to browse on a Saturday afternoon. We are now opposite the famous Primrose Cafe, very popular meeting places for Cliftonites, with both seating inside and outside on the pavement. 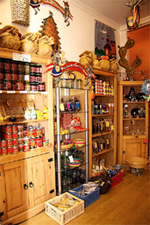 Our shop was painted, decorated and fitted by us and we have used vivid colours to make our products look even quirkier and more Mexican to your eyes. It is fair to say that it turns many people's heads as they browse around the arcade. 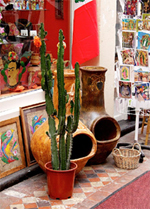 We have tried to create a general Mexican atmosphere where we can expose as many articles from as many parts of Mexico as possible, including some Mexican trans-Atlantic container boxes for storage! We have a lot more stock in the shop than we have online. Some products are one-offs and do not even have the chance to be on our shop for more than a couple of days so, we cannot sell them on this website for those reasons. 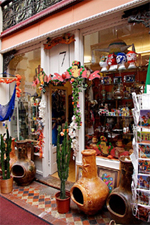 We are a friendly bunch and we enjoy people coming in the shop to talk to us, even to share their experiences in Mexico, or to practice a bit of Spanish. Please feel free to pop in and have a good browse or to have a coffee and a chat.